The Holiday Inn Express Calexico Hotel is only minutes away from El Centro and Mexicali. If you are here for business in Mexicali, we are conveniently located just a few miles from the East Port of Entry Mexican/US Border. We are the gateway to the Maquiladora industry. Our guests commute to the following industrial parks: Cahanilla Industrial Park, Colorado Industrial Park, Cucapah Industrial Park, El Vigia Industrial Park, EX-XXI Industrial Park, Las Californias Industrial Park, Maran Industrial Park, Mexicali Industrial Park, Nelson Industrial Park, Palaco Industrial Park and Progresso Industrial Park. 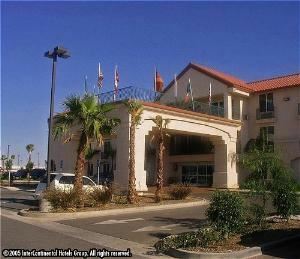 Opened in August 2003, the Holiday Inn Express Calexico is a family owned and operated facility designed especially to accommodate our guests' comfort, safety and convenience. Situated just 2 miles north of Mexicali, the new Holiday Inn Express represents the best that Calexico has to offer in lodging facilities. This multicultural community has a history rich in agriculture and is the center of one of Southern California's most promising new commercial and industrial areas. Our entire staff is trained to maintain the high level of quality you have come to expect when staying with Holiday Inn Express to assure that your stay will be as comfortable as possible. We care for your comfort.